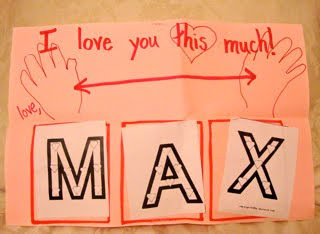 One adorable card from Max. 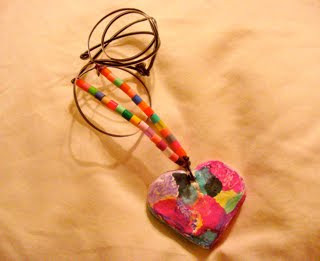 One cool necklace that Sabrina brought home from arts and crafts class. I said, "Oooh, I can't wait to wear it!" She said, "But I want to give it to Amelia!" One package Max spotted a woman carrying at CVS today. He ran right up to her, gestured at it, gestured at me and said, "Ur-ul!" 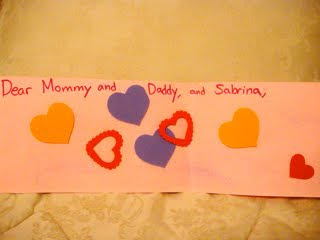 I knew he meant, "I want to give that to my Mommy for Valentine's Day! It's purple!" because he'd already tossed into the cart one pair of purple reading glasses he'd made me try on and a purple bear that said "I love you!" on its belly. I burst out laughing.The woman didn't seem to know what to make of us. In other Valentine's news, Candace and Angela each win the pretty necklace from The Vintage Pearl, and Melissa, Skgaff, and Janet "Grammy" Harold win a big gift box of Sweethearts. Ahhhh, Max. What a sweet kid! LOOOOVE the "purple" incident! I am cracking up! Thank you, my friend, for the wonderful gift. I am thrilled and humbled. I emailed you, so let me know if you got it, k.
This is Joyce. That Max is a smart man. What could be better than a purple package that says you'll always be thin:) I love your boy, just so genuine. The world looks brighter + more alive when viewed through Superhero Max's eyes! "I love you the purplest"? It was in either a book or a movie. Hahahahaha!! Max finds ur-ul in the darndest places, doesn't he? He's got a keen eye! Just what I ALWAYS wanted for Valentines Day! Very, very, nice and genuine always be true to your colors...Hailey's favorite color is also purple. Ahhh, so lovely that he wants to share his favourite colour with you:) Jen. 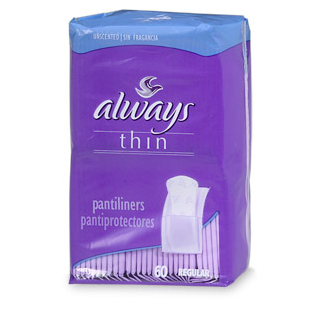 Max is always looking out for his mama :) He's just thinking ahead for you with those purple-packaged pads. At least he didn't want to know what you used the stuff in the purple package for! That day will come a whole lot sooner than you want it to! I love how they had him "sign" name to the card by gluing the correct letters in the correct box. I'm going to have to try that with Luke. Happy valentine's Day, Ellen, and Max and Sabrina! Oh, just saw a reader's comment regarding the book, "I love you the purplest." I know the woman who wrote it, and see her daily. She lives in our town, and I run into her exercising, and at the coffee shop. I can ask her to sign "I love you the purplest" for Max. Let me know what you'd like it to say. What a great idea, reader! I don't know why I didnt' think of that. How lovely ;-). I love how your blog readers are banding together to provide you with more purple suggestions too. Love the blogosphere for this reason. Hope you have a wonderful Valentines Day!! (I am hoping to get some chocolate, but certainly not expecting to! ).